The Killer Inside Me is a 1952 crime novel written by American author Jim Thompson (1906 to 1977). The Killer Inside Me is one of the best-regarded crime novels of the twentieth century, and has received praise from bestselling novelist, Stephen King (The Shining), and the acclaimed filmmaker, the late Stanley Kubrick (2001: A Space Odyssey). In 2016 and 2017, IDW Publishing published a five-issue comic book adaptation of Thompson's novel, entitled Jim Thompson's The Killer Inside Me. The adaptation is written by Devin Faraci, a film critic and podcaster. It is drawn by Vic Malhotra; colored by Jason Millet; and lettered by Christa Miesner. Robert Hack drew the cover illustrations for the variant cover editions of this comic book. In April 2017, IDW published a trade paperback that collected all five issues of Jim Thompson's The Killer Inside Me. At the back of this book, there is a 14-page section of illustrations and sketch material drawn by Malhotra and Hack. IDW sent me a copy of the Jim Thompson's The Killer Inside Me trade paperback for review. Jim Thompson's The Killer Inside Me is set in around the small town of Central City, Texas. Lou Ford is a deputy for Sheriff Bob Maples. Ford is something of a psychopath, and as the story advances, it is obvious that he is a full-on serial killer. As Ford says, he has had a sickness inside him ever since he was a child. Ford hatches a plan of blood revenge against the wealthy Chester Conway, the owner of Conway Construction, which seems to build everything in Central City. Ford's murderous plot involves Chester's not-too-bright son, Elmer, and Joyce Lakeland, a prostitute that Elmer loves and with whom he hopes to elope. Most people in Central City think Lou Ford is a little slow, but they don't know about the sickness inside him, a psychosis that is reemerging as the bodies pile up. THE LOWDOWN: Over 20 years ago, I read my only Jim Thompson novel, The Grifters (1963), which I thought was brilliantly written. Once upon a time, when they were still talking, Fantagraphics Books' Gary Groth interviewed the late Harlan Ellison, in which either Ellison or Groth said that sometimes a work of art or storytelling is perfect in its original form. As much as I enjoyed director Stephen Frears and writer Donald E. Westlake's 1990 film adaptation of The Grifters, I thought the original, Thompson's novel, was perfect. Although this comic book is by no means a disaster, Jim Thompson's The Killer Inside Me could have been better. I don't know what qualifies Devin Faraci to adapt a Jim Thompson novel to comics, especially after IDW published comic book adaptations of Richard Stark's (Donald E. Westlake) Parker crime novels, written and drawn by the late Darwyn Cooke, one of the best comic book creators of the last 20 years. There is something about Faraci's adaptation that seems to accept that it is inherently an inferior work. Even Vic Malhotra's illustrations and graphic storytelling often come across as flat, even listless, unable to convey the power of the original story. Colorist Jason Millet's simmering hues do more to convey Jim Thompson's heat than any other contributor to this comic book. Christa Miesner's lettering is not spectacular, but creates a nice rhythm for the story. While I have mixed feelings about Jim Thompson's The Killer Inside Me the comic book, I can recommend this trade paperback to comic book readers who are always looking for comic books adapted from novels. 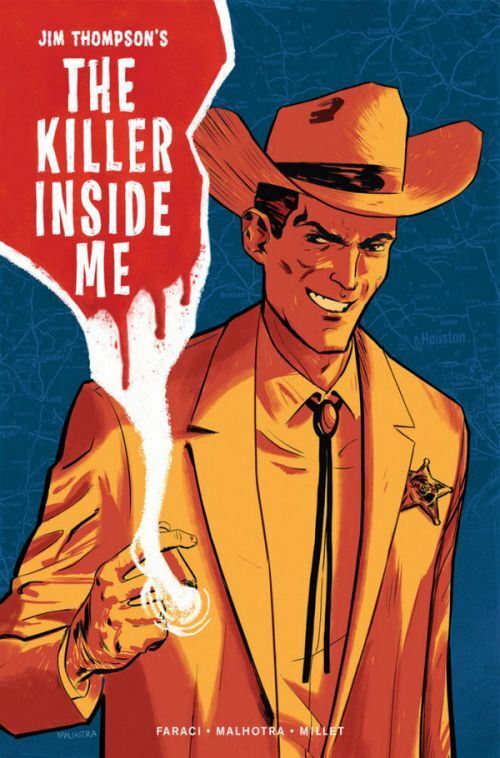 I READS YOU RECOMMENDS: Fans of IDW's comic book adaptation of famous novels may want to read Jim Thompson's The Killer Inside Me.